I’m cuckoo for Coco Puffs, always after those Lucky Charms, and I agree with the silly rabbit: Trix most definitely aren’t for kids. Is it wrong to love something so shamelessly targeted at kids, so sugarcoated and unhealthy, so downright evil? Like Mikey, the Life cereal kid, when it comes to cereal, I’ll eat damn well anything. Or did Mikey hate cereal? Whatever – he died mixing Pop Rocks with Coke. My passion for cereal began long before Seinfeld and his cereal-filled infomercial, er, sitcom. One of my earliest memories is of sitting in my family’s kitchen and sharing a bowl of Dinky Donuts with my imaginary manservant, Peter. Oh, how we used to laugh at each other’s jokes, Peter and I! So, when you ate Dinky Donuts, it didn’t matter if you had a construction crew drilling in one ear and Ethel Merman singing in the other – the only thing you could hear was: CRUNCH, CRUNCH, CRUNCH, CRUNCH, CRUNCH. 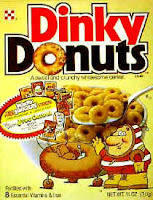 With the great donutty taste, however, came great side effects; weeks after eating Dinky Donuts, you'd be sitting in school, mowing the lawn, talking with your imaginary manservant Peter – anything – when, without warning, you’d have a Dinky Donuts flashback: CRUNCH, CRUNCH, CRUNCH, CRUNCH, CRUNCH. Now that I’m older and more concerned about nutrition, I’ve moved on to Cookie Crisp, which is a more evil junk cereal than most, given that I have to travel into George W. Bush’s America to buy it. Hey, George, don’t take my Cookie Crisp purchase as a sign that I support your foreign policy, OK? OK! Still, it almost seemed worth it when my 16-year-old nieces from Saskatchewan recently visited. I should point out that a relative in Saskatchewan once told me that you can’t eat Coco Puffs in Regina, because if the milk turns brown, they’ll burn you for witchcraft. I don’t know if that’s true, but so delighted were my nieces at the very possibility of filling a bowl with chocolate-chip cookies, pouring milk on them, and calling it “cereal,” two days later my secret Cookie Crisp stash was no more. 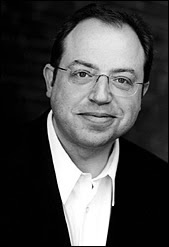 In the great Frontline documentary, The Persuaders, Kevin Roberts says that creating loyalty beyond reason should be the goal of any marketing manager, because that means you can appeal to your heavy-product users forever. Or is that "heavy product-users?" Important to this pursuit, he says, is maintaining a veneer of “mystery” in the product. Just like your girlfriend dumps you once she knows everything about you, a product must strive to be constantly innovative, entertaining, and stimulating, or suffer the same fate. This explains why a household of four has seven iPods, why people travel 500 miles to shop at an Ikea, and why at age 40 I’m still eating junk food for breakfast. It’s the mystery, stupid. Something tells me that the CSI guys wouldn’t be too interested in solving the Dinky Donuts mystery, though they’d be well advised to get to the bottom of whether Frankenberries are supposed to make your urine turn red. My relationship with junk cereal reminds me a lot of what my father once said about Wal-Mart: “I hate Wal-Mart for putting local merchants out of business, but I love their low prices.” I hate junk cereal because, well, it’s junk, yet I love its tasty donutty goodness, incisors be damned. Still, I have a dream that one day I’ll break the addiction and move on to something less evil, like…um…Pop Tarts? Until that day, I’ll take comfort in the words of John “Sitting on a Corn Flake” Lennon: “You may say I’m a dreamer, but I’m not the only one; I hope someday you’ll join me, and…CRUNCH, CRUNCH, CRUNCH, CRUNCH, CRUNCH. 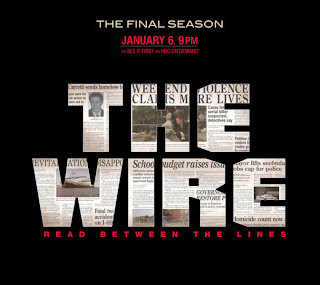 I recently finished watching the last season of the Wire, the ridiculously great show that no one ever watched and, incredibly, did not get nominated for a single Emmy this year. Its final and maybe best season is all about our hero, Jimmy McNulty, getting so fed up with things at the Baltimore Police Department that he "invents" a serial killer to get a cop car that works, a wiretap, and overtime hours. I won't get into how he gets the bodies or links the crimes, suffice to say: he does. Great premise. The even-better thing about the season is that we get to see the inner workings of the Baltimore Sun. The morally bankrupt cop has nothing on the fledgling journalist who, realizing that reporting takes work and sources, "sweetens" his stories with phony quotes and people who may or may not exist. Of course, the management at the Sun doesn't care if some of his facts are questionable, because "if it bleeds, it leads." The definitive season highlight is McNulty calling the journalist and pretending to be "the serial killer," knowing full well that the journalist is making up the facts as he goes along. Funny and thrilling in a "don't get caught, Vic Mackey!" kind of way. That's all I'll say, other than that this should be required viewing for everyone as a primer on cops, politics, PR, education, and journalism. If you've never seen an episode, I envy you: order the five seasons on DVD and watch them in a row. If you don't think that it's the best TV you've ever watched, then - like Leone Baxter once said - you like corn more than caviar. Welcome to Kenton's Infotainment Scan. Yep, the title is a tribute to Mark E. Smith and the Fall - a great musician who knows a good media scan (or is it scam?) when he sees one. As the subhead sez, this site is for people like me, who love and hate the media in equal measure but can't stop consuming it, who are fascinated by how journalists, PR people, and advertisers work together or don't work together to make the media landscape what it is today, and who love to pick it apart piece by piece. This blog was born this week, as these things are, innocently enough. I was watching the Olympics coverage on NBC, when anchor Brian Williams said, "It's so easy to like Michael Phelps." I instantly thought, "That's funny, because I hate Michael Phelps." Yeah, he won a lot of medals. Yeah, I'm Canadian, which might make me dislike him more than the average North American. But, let's just say that when I'm at parties, I give wide berth to anyone who looks like they might put me in a headlock 30 seconds after meeting me. That "Mortal Kombat" yelp at the end of that one race scared the bejesus out of me, as it should you. It's been pointed out already, but I can't get past the fact that he looks a lot like Screech on steroids. 4. A great Wonderbread ad, which you can see here. I'm not a sports guy in any sense, but I have enjoyed the CBC's coverage of the games, which may be surprising, coming from the network that picked up Wheel of Fortune and Jeopardy! on taxpayers' dollars THIS YEAR! The two new, hot shows that the kids can't stop talking about...sigh. Still, what the CBC does, it does well. And, as long as Ron MacLean's along for the ride (don't lure him away, NBC) all should be well. Lastly, as I point out in my bio, I'm an instructor at Red River College in Winnipeg, Canada. Our program is called Creative Communications and covers Ad, PR, Journalism, Broadcast and more. I say this as an instructor and a grad of the program: it's one of the finest programs of its kind. If you think you'd like to do this media analysis stuff full time, or work in the media full time, it's the place to be. Check out the Red River College website here for more info.